Our approach is one of acting in harmony with the environment rather than in competition. All projects are uniquely designed to be sympathetic and respectful of the immediate surroundings, whether natural or architectural. 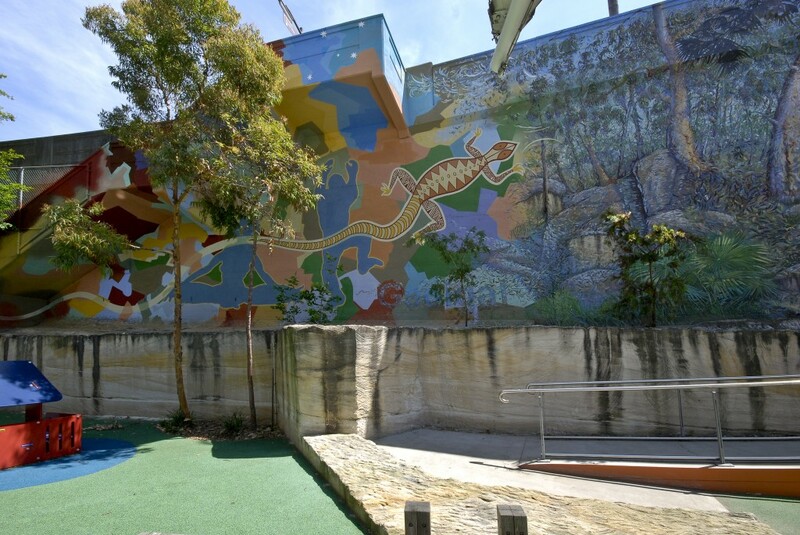 Painted in the early 1980s, the Mural is a trompe l’oeil, or optical illusion to make the western wall of the recreation centre ‘disappear’. 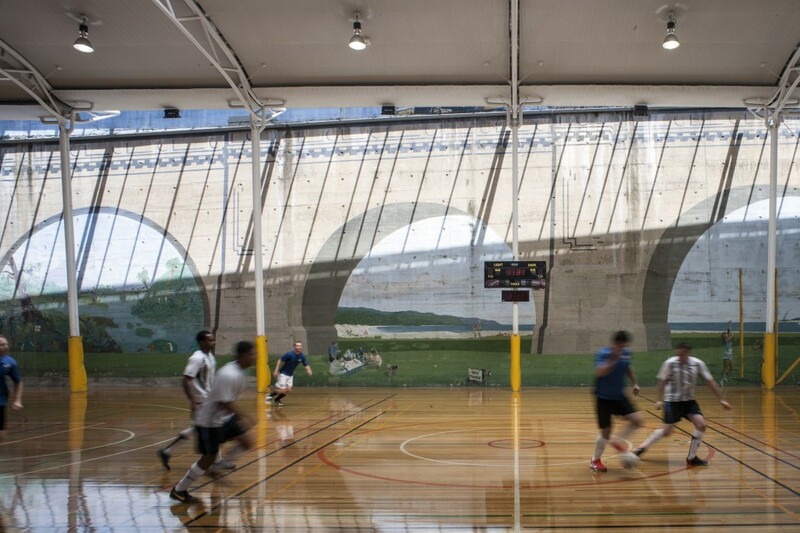 Located at the King George V Recreation Centre on Cumberland Street, it depicts a series of arches echoing the form of the Argyle Cut. The images tell the story of the history of the Rocks from the dreaming to present day. 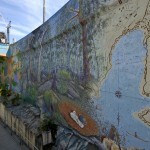 The Mural’s predominant themes relate to aspects of The Rocks’ historical significance and were suggested by local residents. They include the impact of the Harbour Bridge on the community; built and natural features in and around the locality, including cliffs; the harbour and maritime transport. 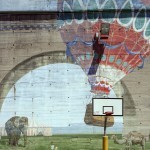 Circus-giraffes and elephants also feature in the mural. Peter Day was born in Sydney in 1949 and studied Industrial Design at the National Art School. 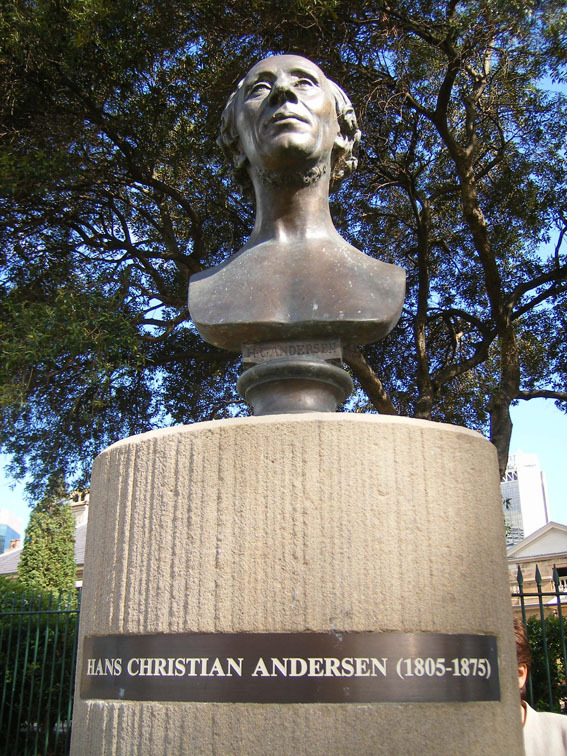 He later undertook a Post-graduate Diploma in Industrial Deisgn at the University of NSW and a Post-graduate Diploma in Professional Art Studies. For much of his career, he has run his own design consultancy, including founding the Kirk Gallery, a non-profit community arts centre in Surry Hills. Peter has also taught painting, design and sculpture at various Sydney colleges. He is the Artistic Director of the award-winning Peter Day Environmental Art+Design (EA+D), which specialises in site-specific public art. 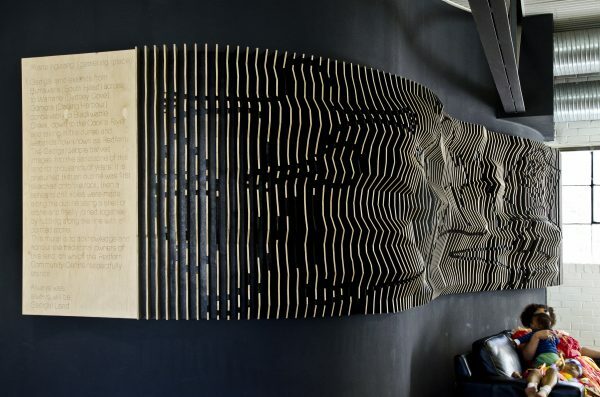 His body of work includes but is not limited to murals, ceramics, sculptures and mosaics. In May 1980, the City of Sydney undertook a redevelopment of the King George V Recreation Centre which first opened in 1937. 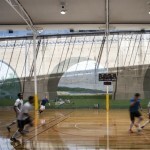 Despite the continued use of the recreational facilities at the Centre, the City decided that the concrete wall (15 metres high, 100 metres long and owned by the Department of Main Roads) was an oppressive backdrop to the Centre. R.D. 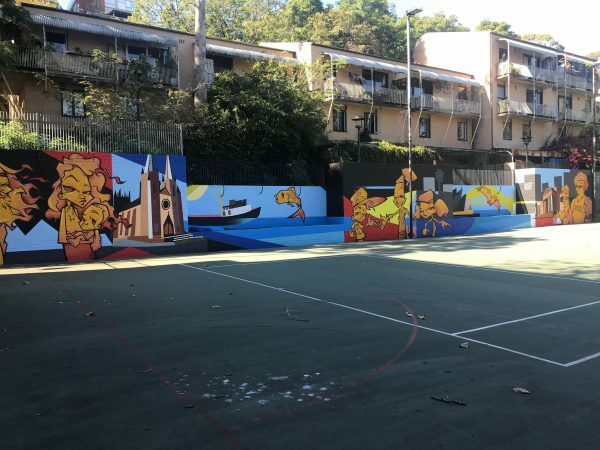 Stringer, the Director of Parks and Civic Affairs at the time, suggested that the Centre could be enriched by using the wall as the base for a large mural that would refer to the local area’s character. 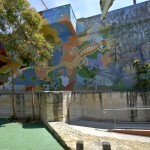 On 25 May 1981 the City of Sydney gave approval to a proposal to paint a community mural on the wall behind the Centre. 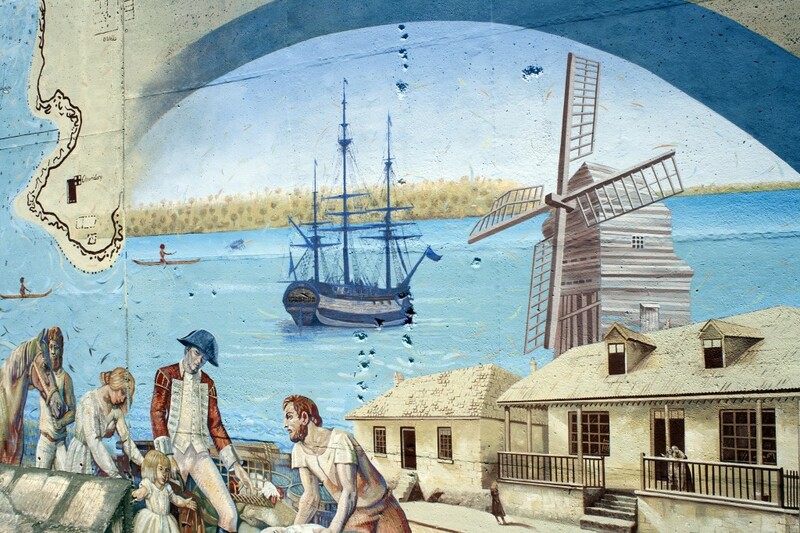 Peter Day, a community artist and muralist, was commissioned on 12 October 1981 to undertake the mural. 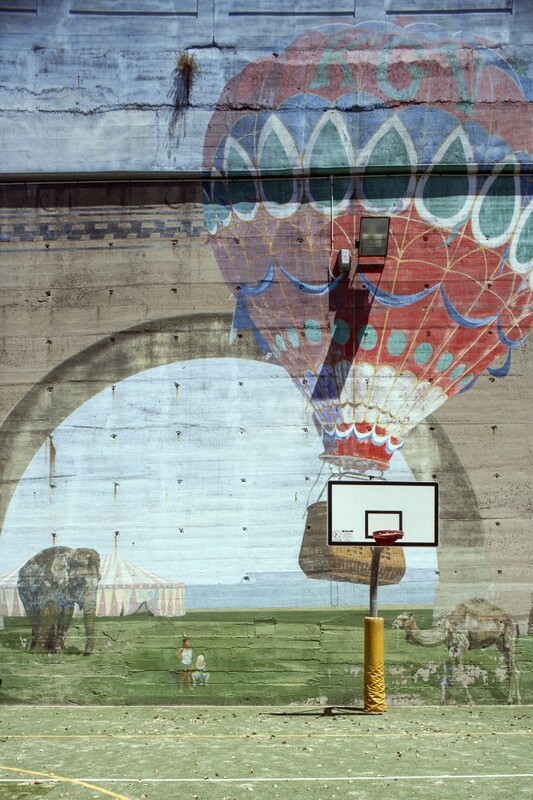 His brief included involving the local community in planning and designing the proposed mural. 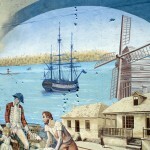 Day completed his community consultation in May 1982 and the design of the proposed mural was approved on 15 November 1982. 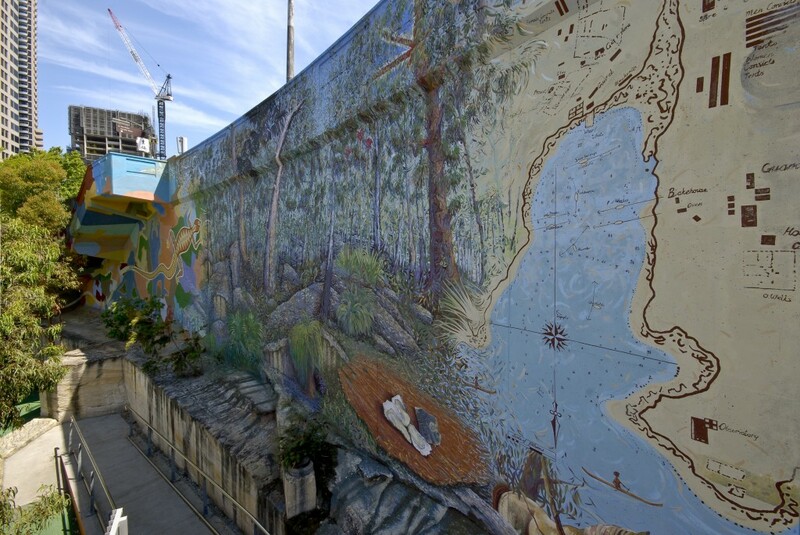 Painting began later that month and the mural was unveiled in February 1983.